Here's another version of that same card. 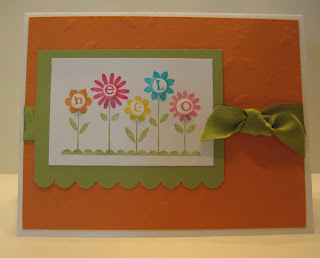 We are doing "summery" cards this weekend at my stamp-a-stack, and I thought this one fit the bill, but it needed some tweaking. 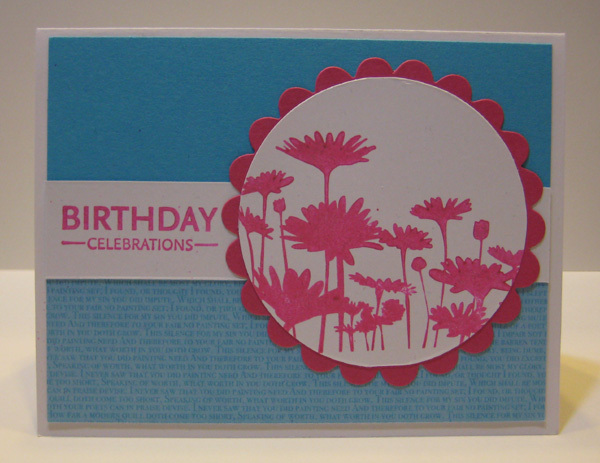 I don't have enough Designer Series Paper for everyone to do 3 of this card so we will be using a texturz plate and the Big Shot. I also decided to eliminate the ribbon. Tiny bows are not very popular on stamp-a-stack nights since we do multiples of each card, and I like the card with and without a bow. One of my many "summer resolutions" is to participate in sketch and color challenges on the internet. I thought it would be fun to shake things up a bit and try someone else's colors and layouts since I have my favorites that I use often. So I decided to start with Mojo Monday's week 192 sketch. Maybe I should have done a color challenge at the same time because picking colors seemed to be the most time consuming. I had the sketch with me as I pulled out three stamp sets to choose from. I opened Flight of the Butterfly and never even tried the other two. Here is the original sketch. I stuck pretty close to the sketch this time, but maybe next time I will branch out and deviate a bit. Yesterday was our last day of school, and I was in need of a few thank you notes for some nice end of the year gifts from students. And since they were mostly boys, I went with a low-frill card. 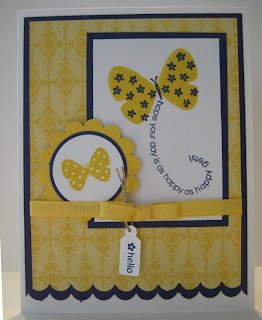 This was inspired by a swap card I saw a couple of years ago and it has always stuck in my mind as good teacher card. Using the Round Tab punch to make the apples is so clever and easy too! Here are the two apple cards I did last year. 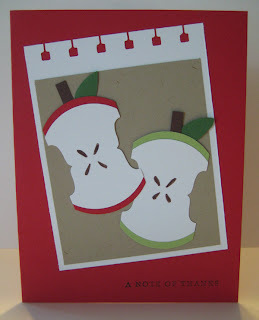 Card 1 Card 2 Check back next May for what likely will be another apple punch art card! 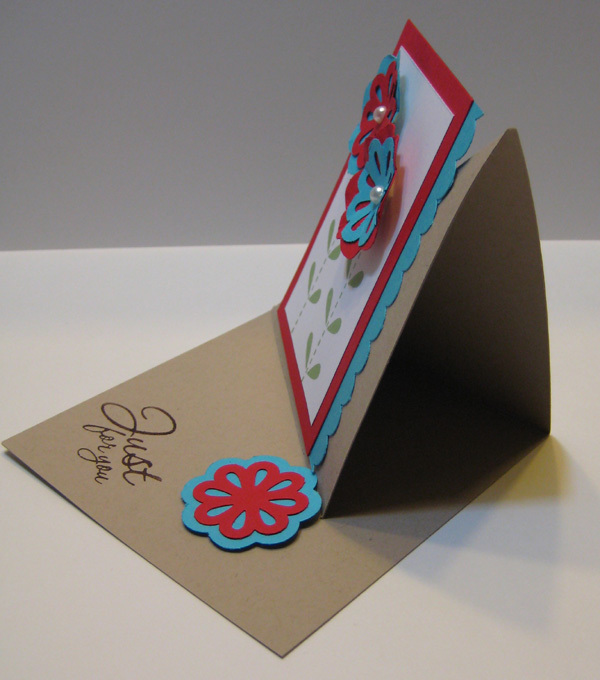 We've done an easel card in stamp club before, but last week we tried this twisted easel card. It folds flat and square, but when you fold up the top cover it "twists" and creates a sideways look. You'll notice we used one of the new triple layer punches on the inside and outside and combined that with the stem from Bold Blossom. Here's a side view to give you a better idea how it looks standing up. 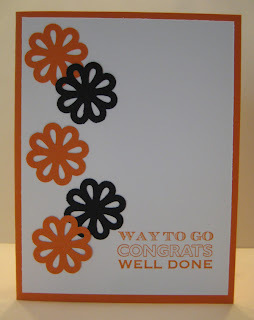 Here is a recent stamp club project. We made gift card holders with the regular sized (medium) envelopes. 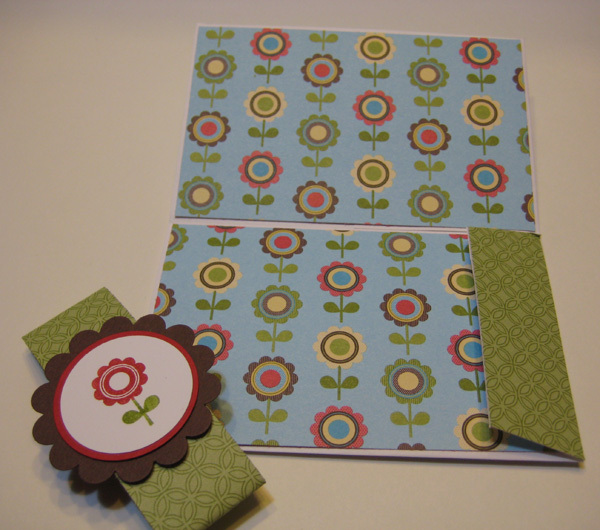 Fold it, cover it with Play Date Designer Series Paper, stamp the flower from Funky Four and you have a cute little gift card holder. 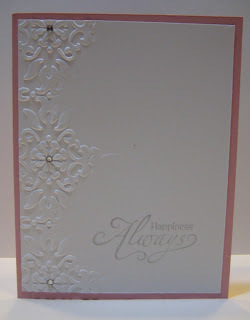 At our Spring into Stamping meeting last month, Tami White demonstrated embossing folders. 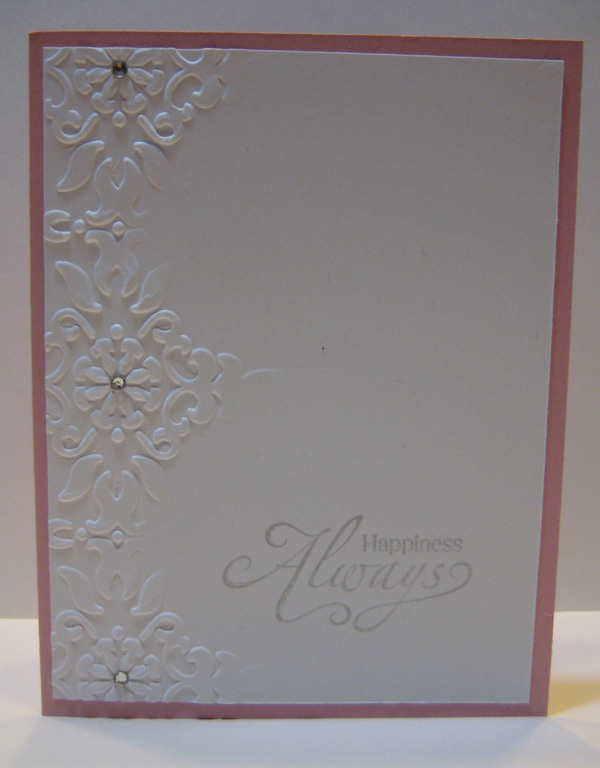 Some people cut them to emboss only part of the card, but this is so much better for people like me. I had ordered this embossing folder a long time ago when I first learned you could cut the folder and create sections of embossing, but I just couldn't bring myself to cut into it and "destroy" it. So it sat in my drawer until I saw this! Emboss a piece of cardstock and use it at your pattern. Trim away the parts you don't want embossed and then cut a piece of chipboard to match. Put that chipboard (I taped my down so it wouldn't move) on the outside of your folder. Run it through your Big Shot on platform 2 with only 1 cutting pad. I added some rhinestones in the middle of the designs for just a little bling. I know people say it all the time, but this card really does look better in real life. It shimmers! Simply mix shimmer paint with a couple drops of reinker, and you have shimmery Melon Mambo. 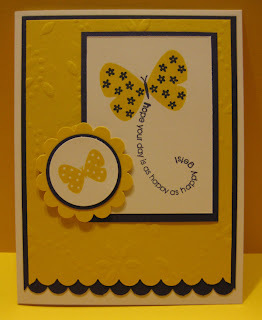 Apply it directly to your stamp with a sponge dauber - so easy but such a dramatic look. 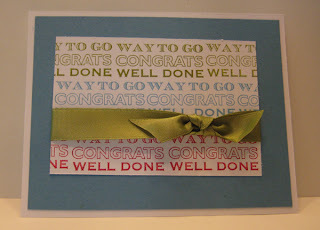 I am in the graduation card mode right now, but here is a more general card I can use for reasons other than graduation. 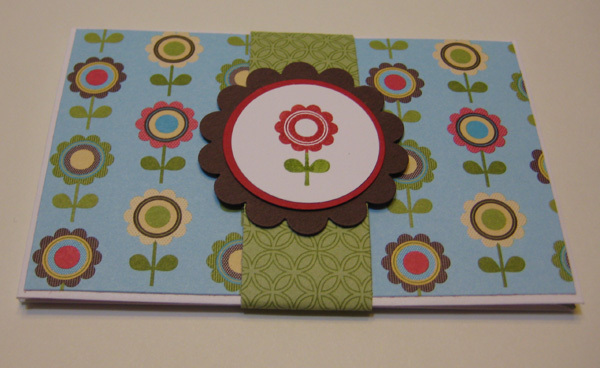 It uses the stamp from Happy Greetings in the new summer mini catalog. Looks like a wheel, doesn't it? The ribbon helped fill in the slight space between the two colors and finishes off the card. I made these sets of 5 cards for a vendor fair I just did last night. 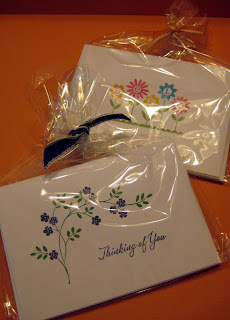 They are note cards so a little smaller than most cards I make and fit into a cello bag just perfectly. I just love that Hello Blossoms stamp and thought the other set might be nice with a variety of greetings using the stamp from Thoughts and Prayers. 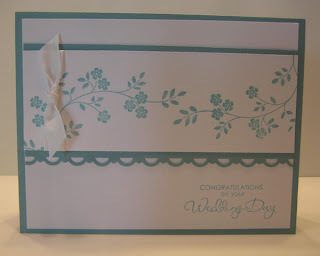 I try to do a wedding card at my stamp-a-stacks about this time every year. But then if you don't have 3 weddings coming up, you've got cards you can't use. So this card works for most any occasion and gave the ladies lots of different options. 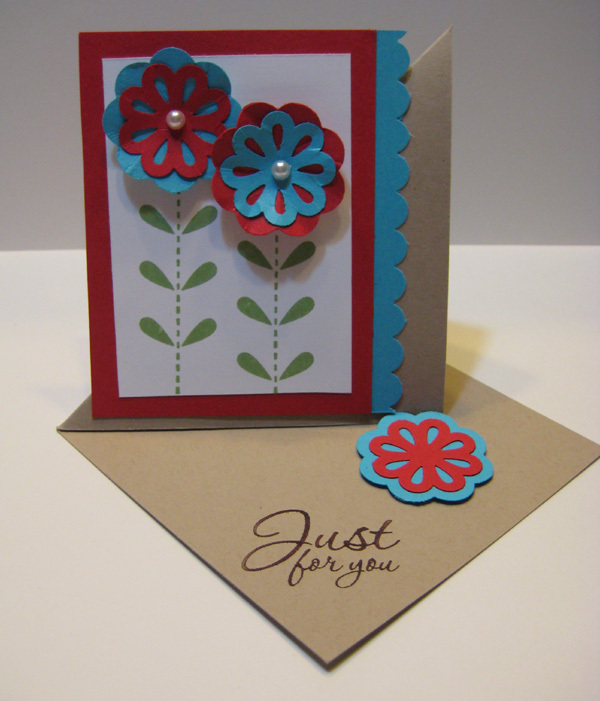 This card was inspired by Connie Sylvester at our recent Spring into Stamping where she was demonstrating the awesome new triple layer punches. 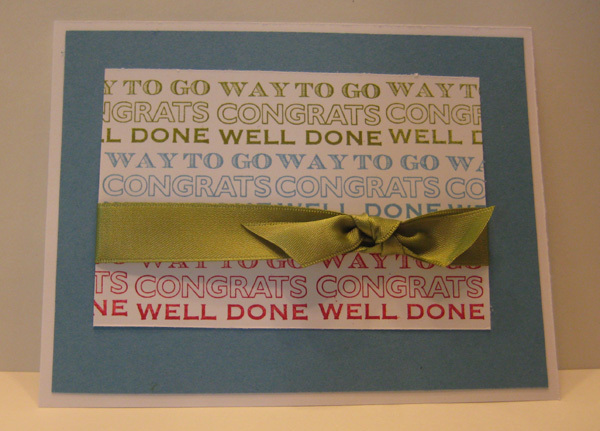 I designed this as a congratulations card, but it could just as easily be any other type of card. 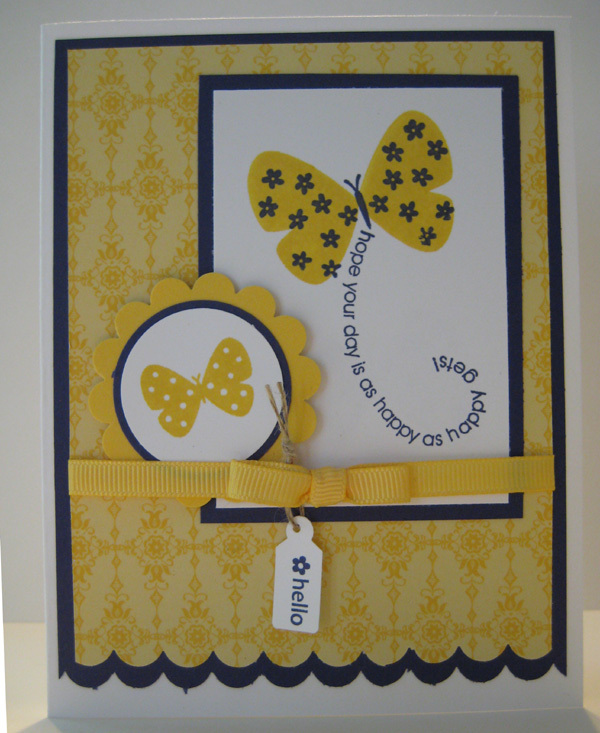 For more personalization, you could make it with school colors and make a graduation card. Isn't this stamp great? 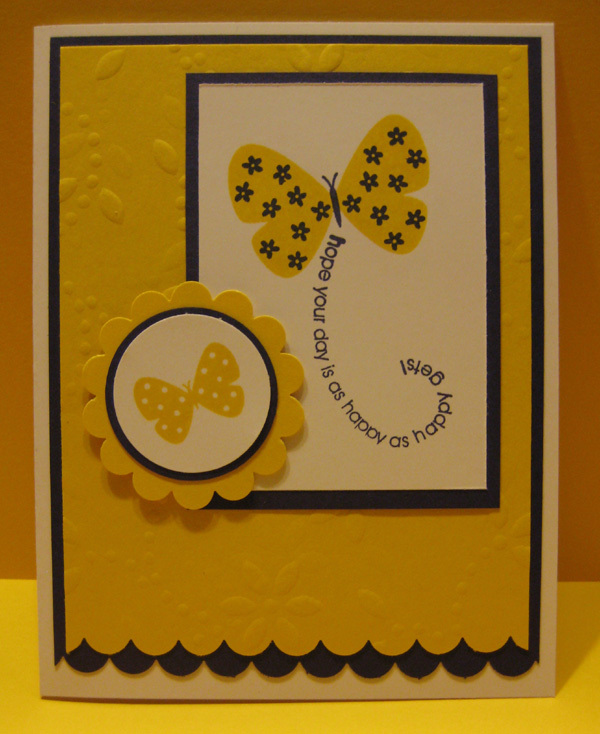 It makes such a sunny, cheerful card. 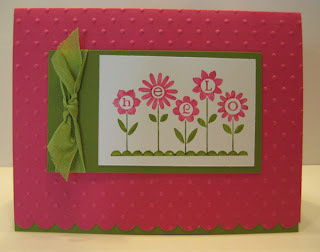 One of my favorite new stamps from the Summer Mini Catalog is this Hello Blossoms stamp. It is $7.95 and has so many possibilites. 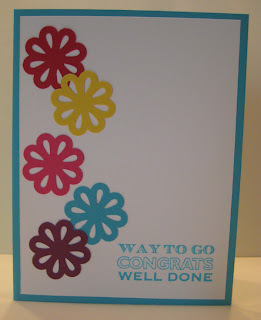 Use your markers to color directly on the stamp and the sky is the limit on flower colors and combinations. Keep watching my blog for more creations using this quick and easy stamp and consider joining us this Friday to make this card and two others at my stamp-a-stack. Summer Mini Catalog Starts Today! 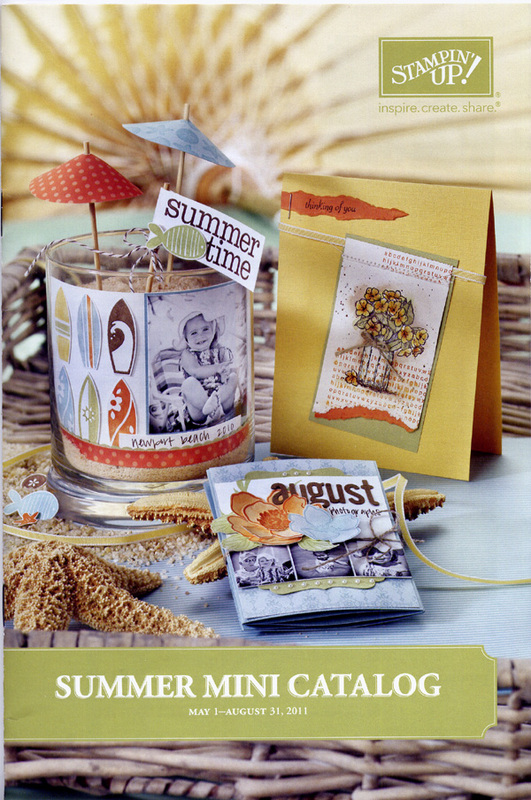 The Summer Mini Catalog starts today and it is full of great new products! Click here to view the catalog or email me and I will send a copy out to you right away!